All of the group arrived at least a day before the tour was due to commence, 7 of us flew into SAN JOSE at 4pm today, whilst 4 others arrived a couple of days ago and one couple arrived on the 4th Feb! 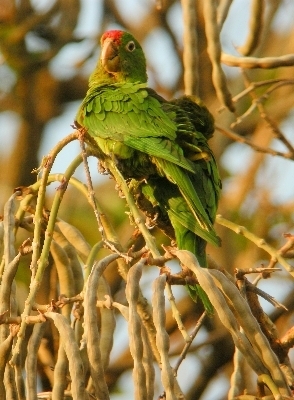 London to San Jose - a short birding walk near the hotel in San Jose. At 5pm we were settled into our hotel located very close to the airport and three of us elected to go for a ahort walk, it had to be short because it gets dark at 5:30pm. In the hotel grounds we listed; White-winged Dove, Ruddy Pigeon, Great-tailed Grackle, Rufous-collared Sparrow, House Sparrow, Blue and White Swallows, Turkey and Black Vultures and a hugh cilony of Crimson-fronted Parakeets. The light faded fast it was time to go back to the hotel, we ate in a small diner opposite the hotel.